We've gone through Dinosaur National Monument & Colorado National Monument over the past 4 days, and now we're moving onto Black Canyon of the Gunnison National Park, Mesa Verde National Park, 4 Corners, Arches National Park, and we'll probably see the Great Salt Lake for a few minutes before flying out of SLC. We're having a very busy week. It's been a lot of fun, and I'm very glad we're here. We'll see how well tomorrow goes; we're going to hike about 1700" down into the canyon, and there's poison ivy bushes all over there. We've got Ivy Block, wipes to clean up the skin, and a decontamination plan for when we get back to the car. Cross fingers & toes that it works! 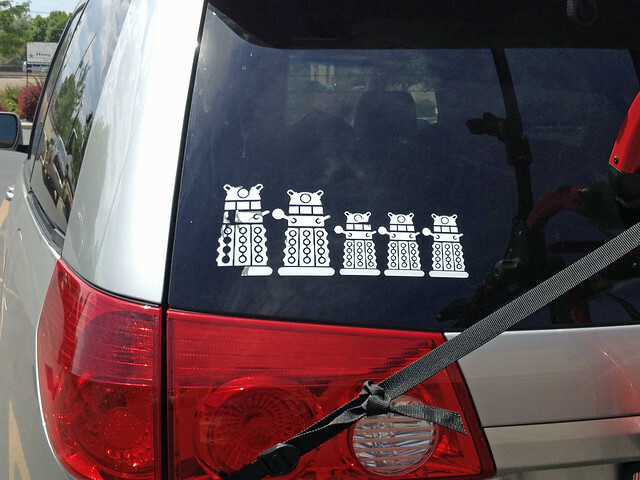 Oh, and Daleks have invaded Grand Junction, CO. Run for your lives? This entry was originally posted at http://merhawk.dreamwidth.org/509805.html. Please comment there. If you don't have a DW account, you can use OpenID, or ask me for an invite code (if I know you/know of you). I might have extras.